Political cartoon ideas about Bush budget. Above image is crude, but hope you get the point. 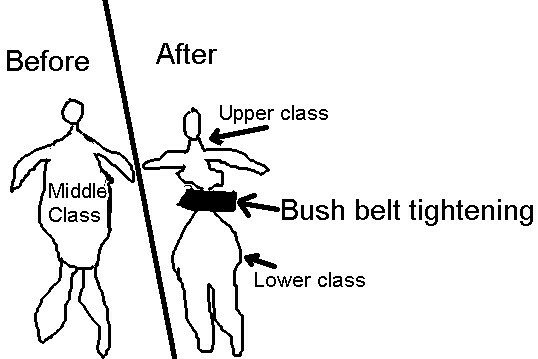 Budget belt tightening splits formally fat around the middle "middle class" into two sections. Top is upper class while bottom is lower class. 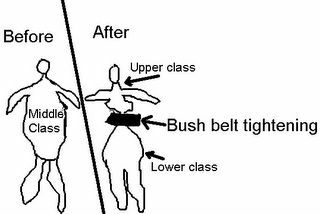 The tight belt is splitting middle class in two. Maybe I shouldn't even try drawing the other idea. It is Uncle Sam playing strong, holding up the world, but can't even afford a good pair of shoes at his domestic foundation. If someone wants to draw these concepts better, it can be considered a collaborative effort.